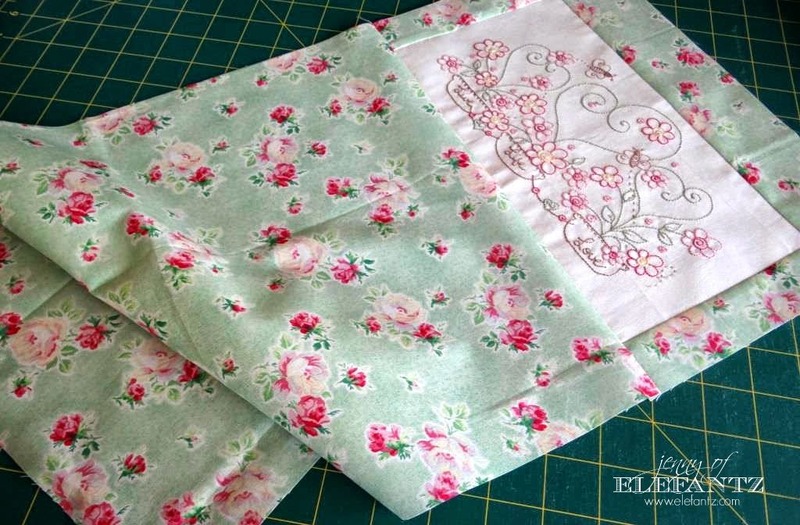 Jenny of ELEFANTZ: TUTORIAL - let's make a Rosedaisy Bag! 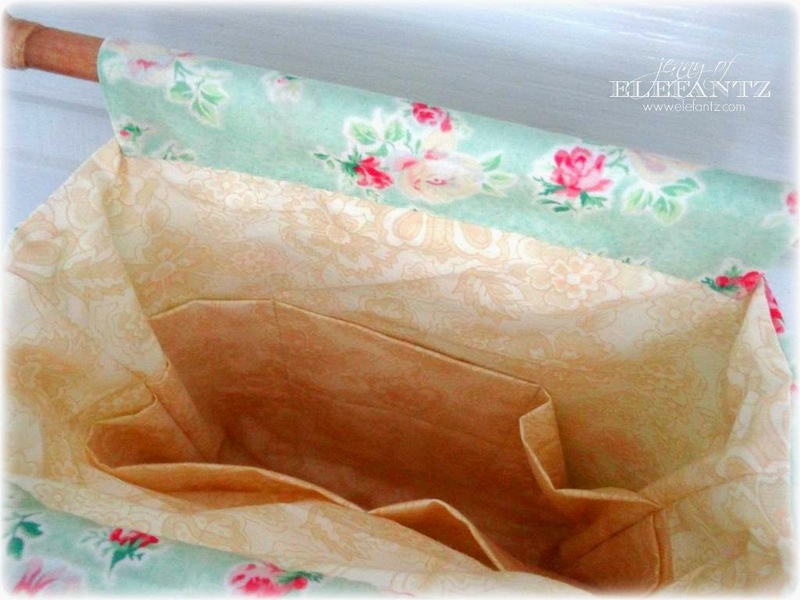 TUTORIAL - let's make a Rosedaisy Bag! The 20th of the month rolls around pretty quickly doesn't it!? 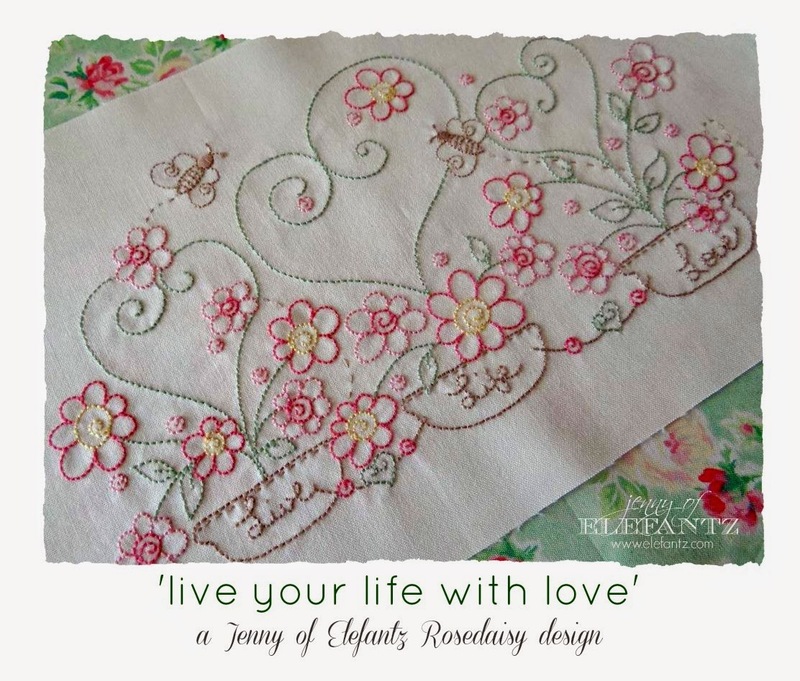 But I'm sure that's a good thing because it means I'm sharing another Rosedaisy Tutorial. 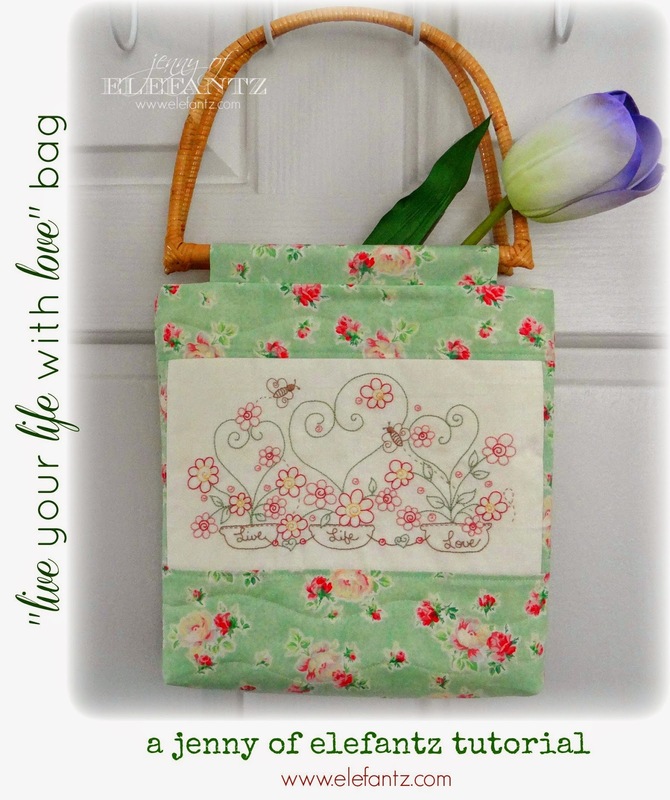 ...and we're using it to make this sweet bag! 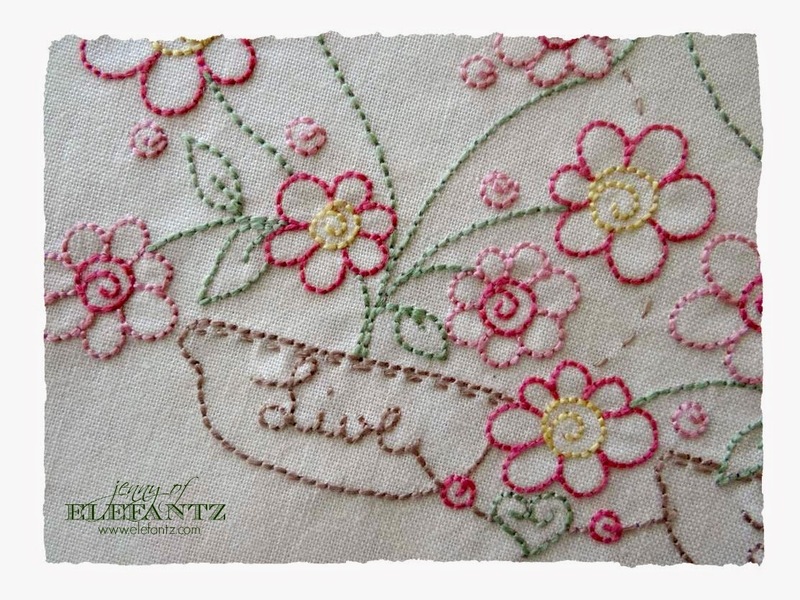 If you'd like to purchase this stitchery pattern to feature on your bag it is HERE in the shop as a single pattern, or HERE as part of the 10-stitchery Rosedaisy set. 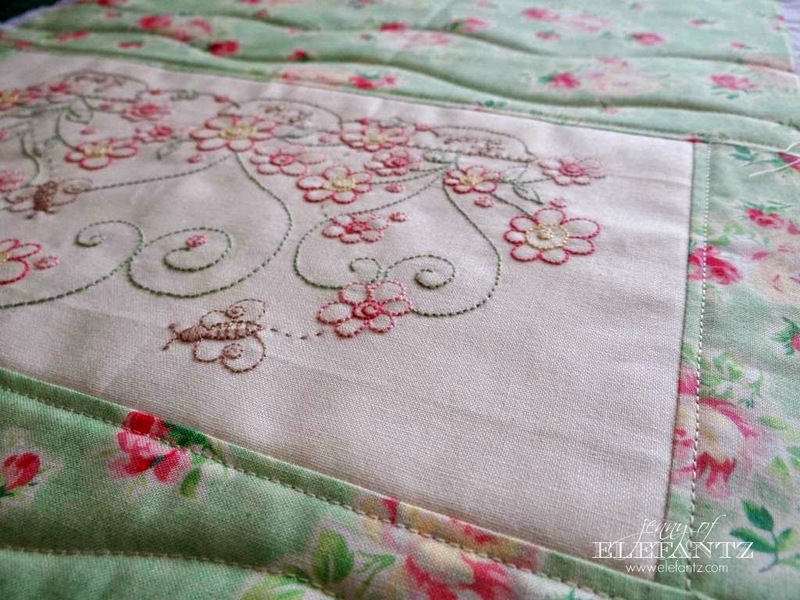 One feature stitchery measuring 6" x 10 1/2"
One length of fusible Pellon 14" x 26"
Sew the 1 1/2" x 6" lengths of green down both sides of your stitchery, and the 2 1/2" x 12 1/2" length across the top. 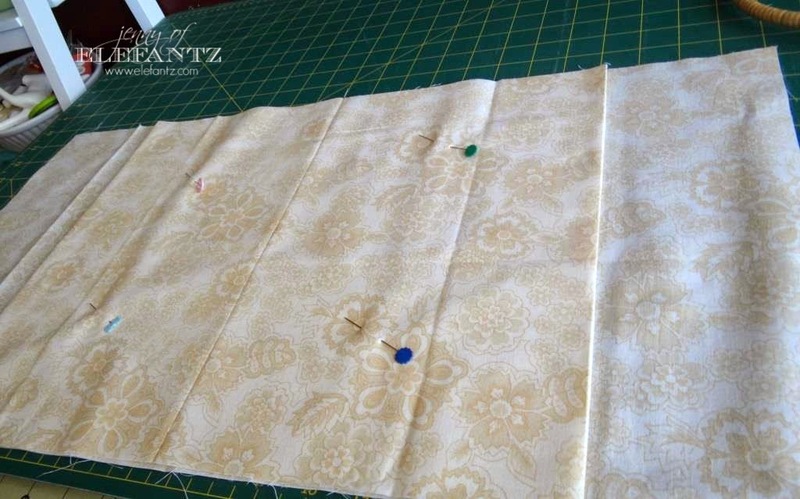 Sew the 12 1/2" x 16 1/2" length across the bottom. 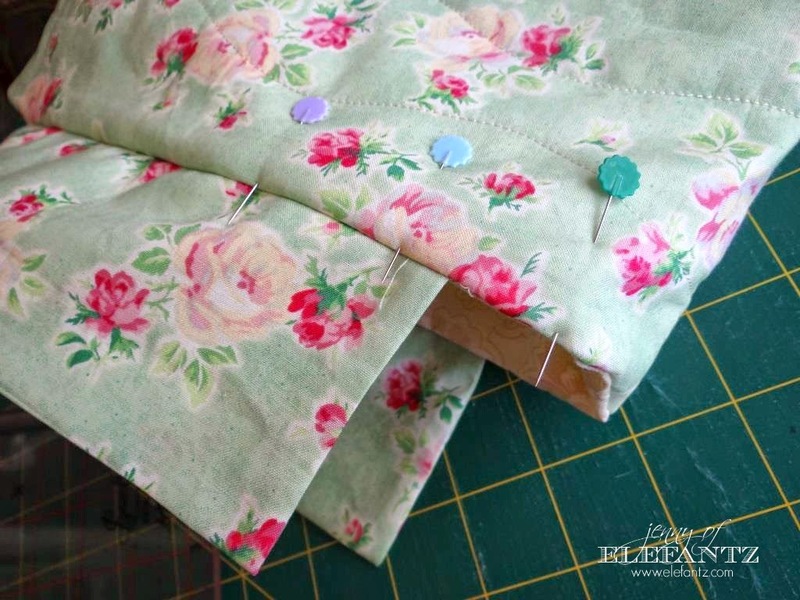 Press the seams away from the stitchery. 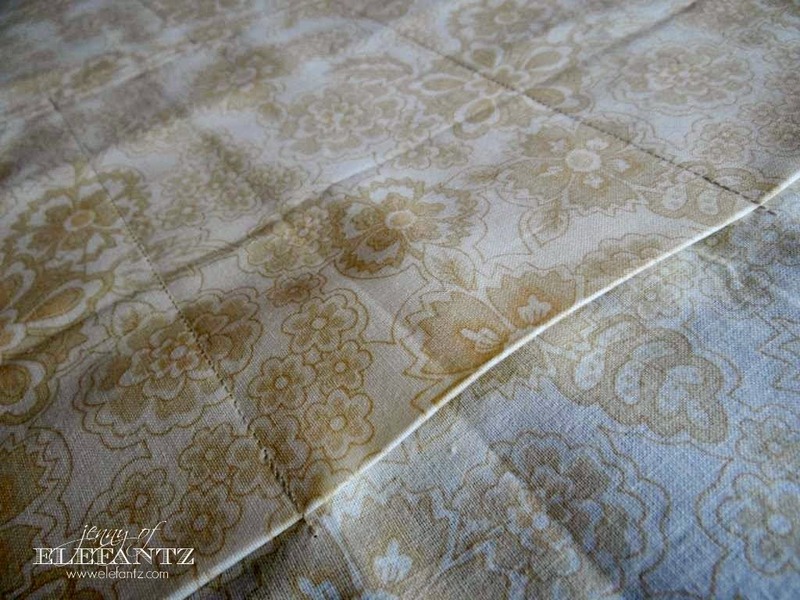 Now we're going to use the two lengths of cream tonal fabric. Press this section flat with your iron. 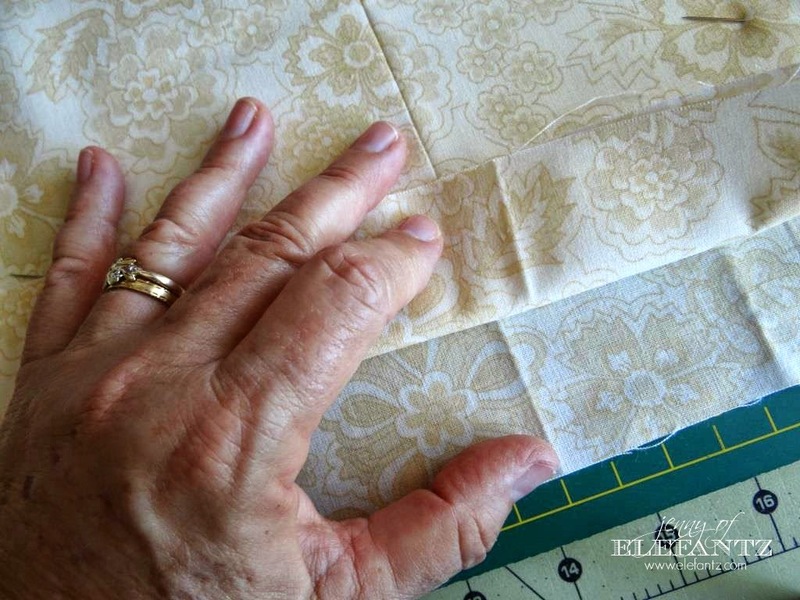 Find the centre of the 12 1/2" x 24" length of cream lining and finger press a fold. Open it out again and lay flat, right side facing up. 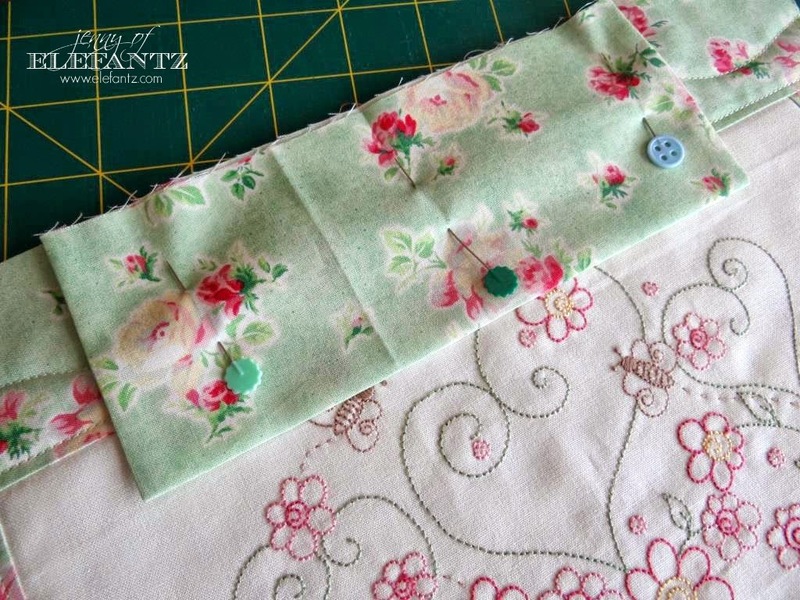 This is where you will sew down the length of your main pocket sections to make smaller pockets if you like. I have two pockets on one side and three on the other. 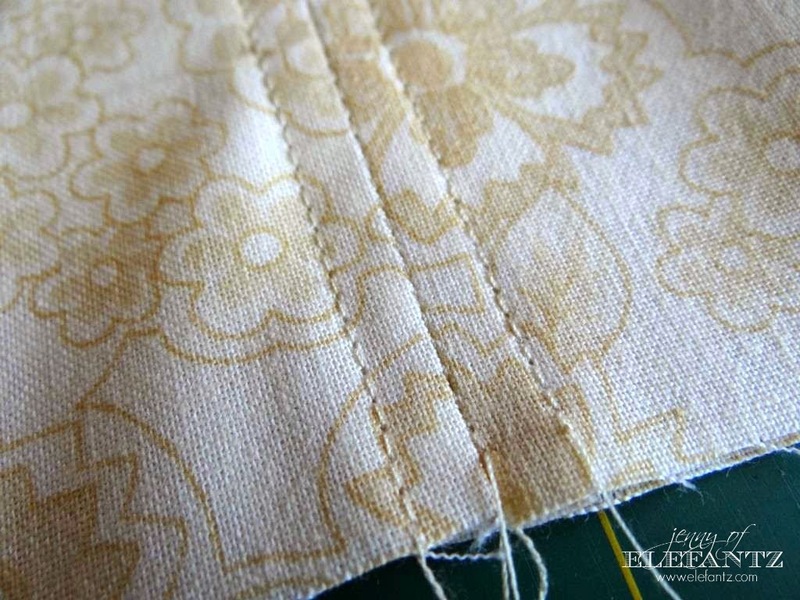 Sew your lines from that triple seam line across the centre, to just above the top of the pocket edge. 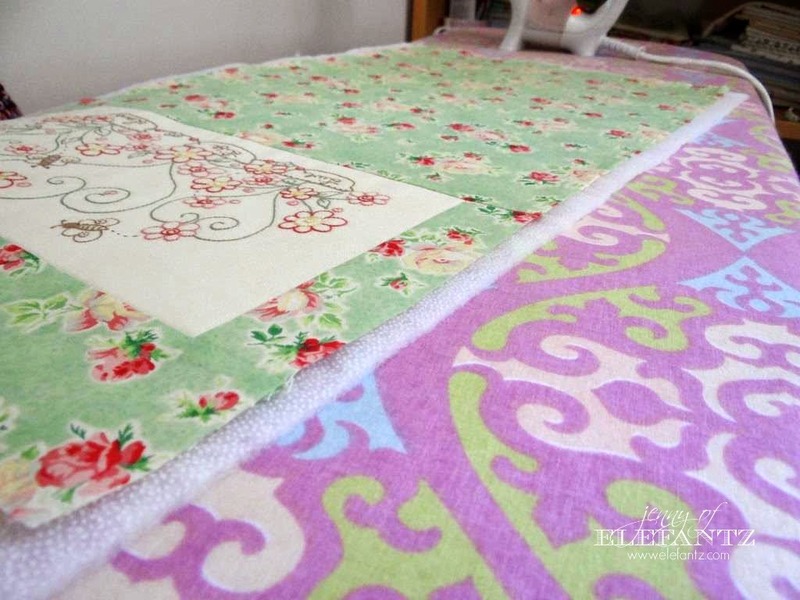 Reverse your machine needle back and forth a couple of times for extra security. 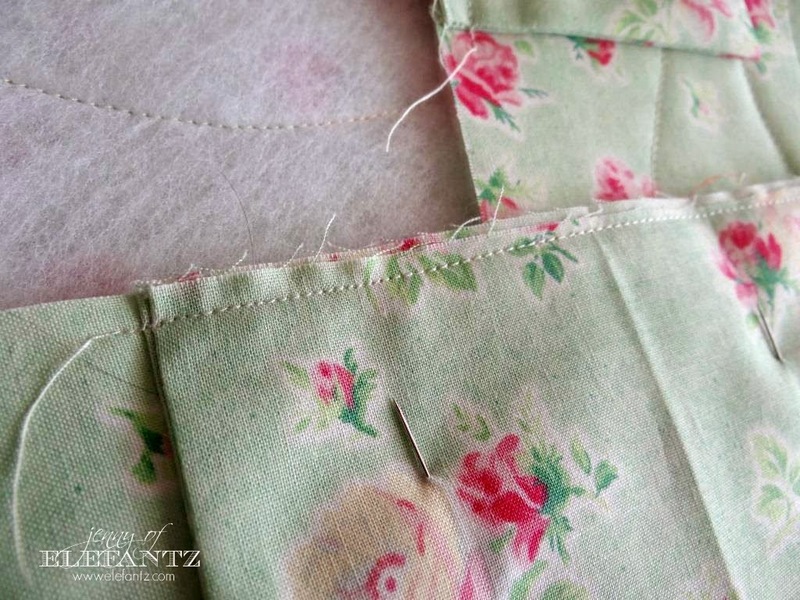 ...and sew down both sides with a 1/4" seam. Trim away the excess Pellon. 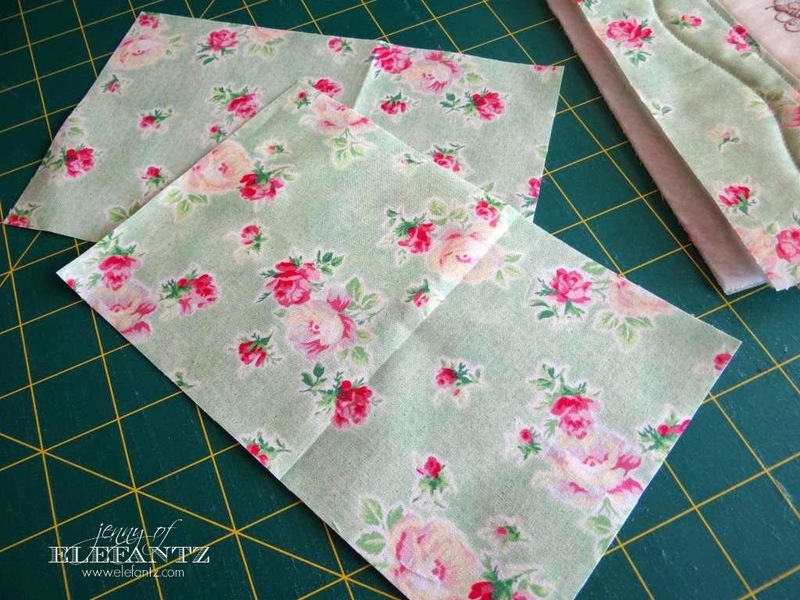 Take your two, 6" x 8" lengths of green floral fabric, and fold them in half - right sides facing. Turn them right side out and press flat. Now we're going to 'square' the bottom edges. 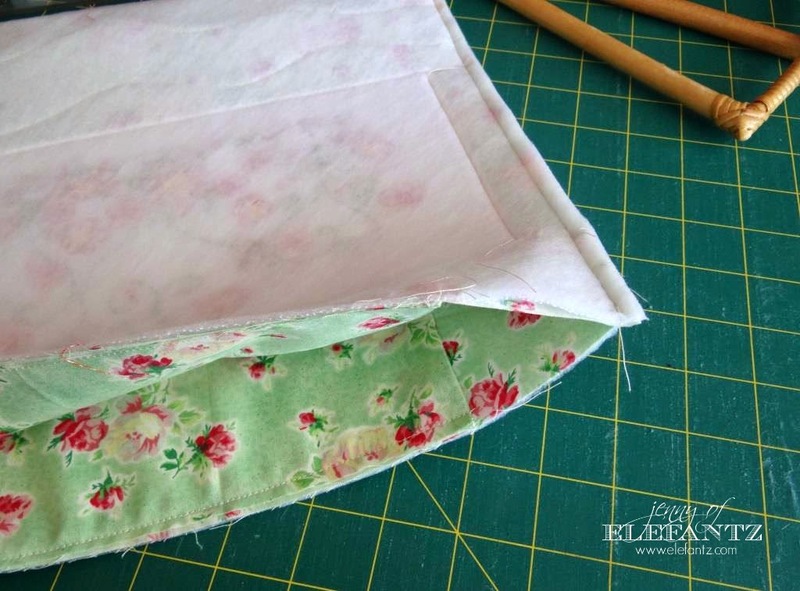 Fold one side seam down onto the centre of the base, forming a point at the bottom of the seam. 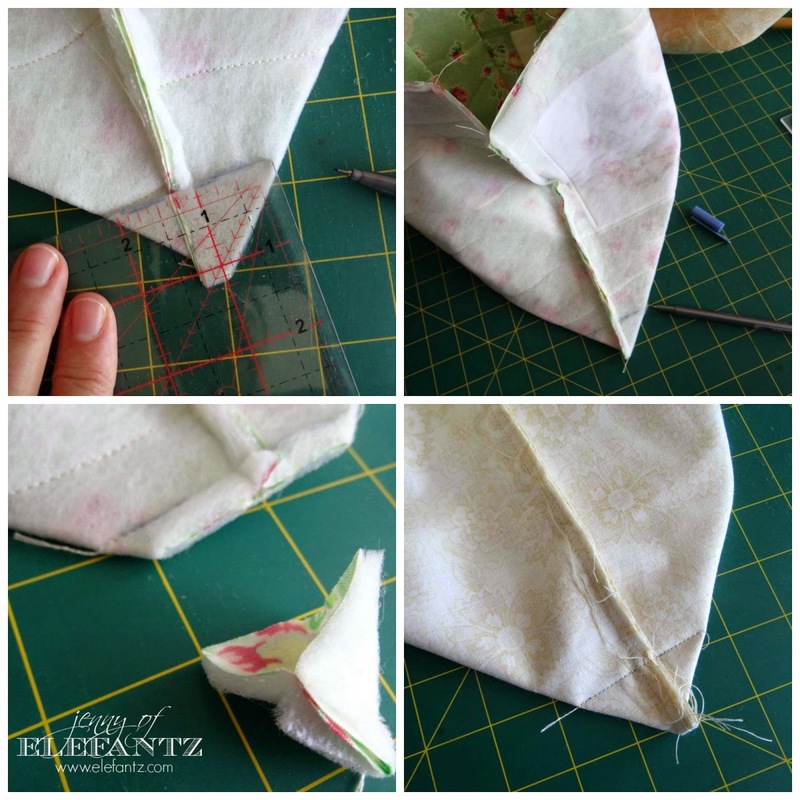 Draw a line 1" from the point, then sew across the corner. 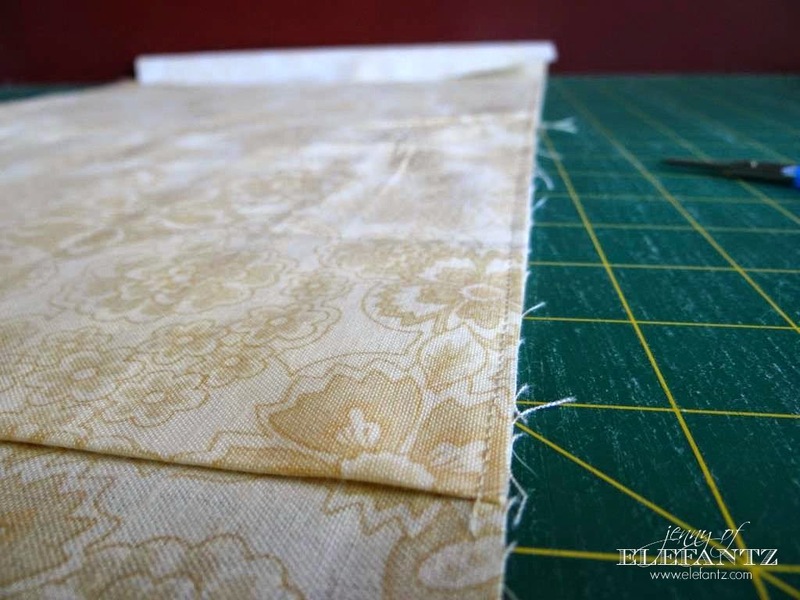 repeat for the other corner, then trim away the point leaving a 1/4" surplus from the line. 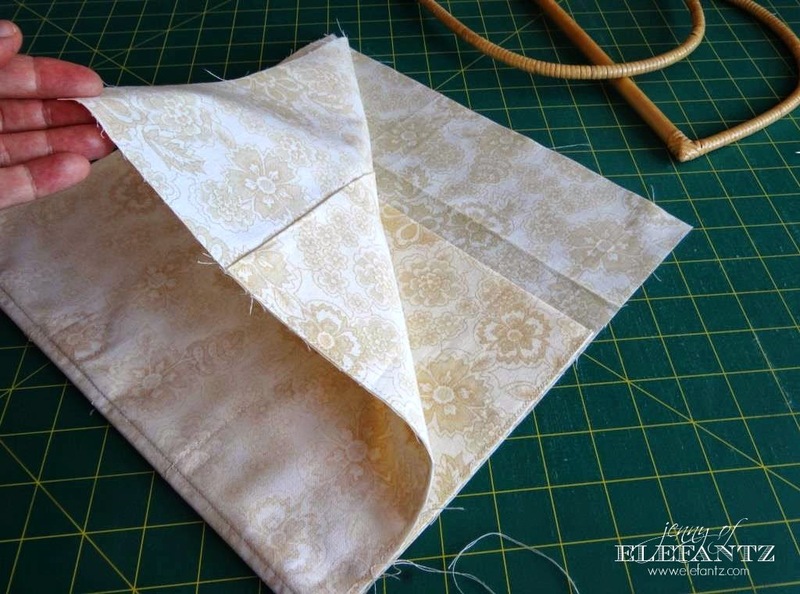 Turn your bag lining right side out. 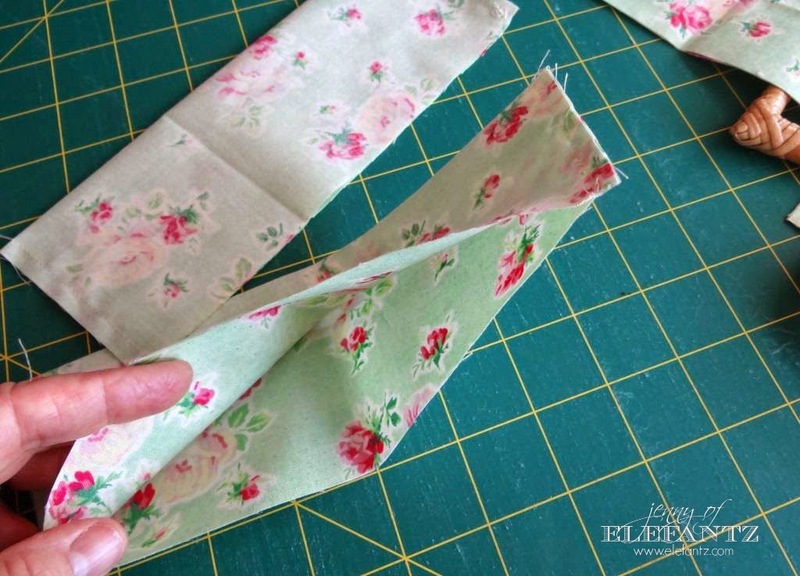 Sew around the top edge with a 1/4" seam, but LEAVE a 3" or 4" opening. 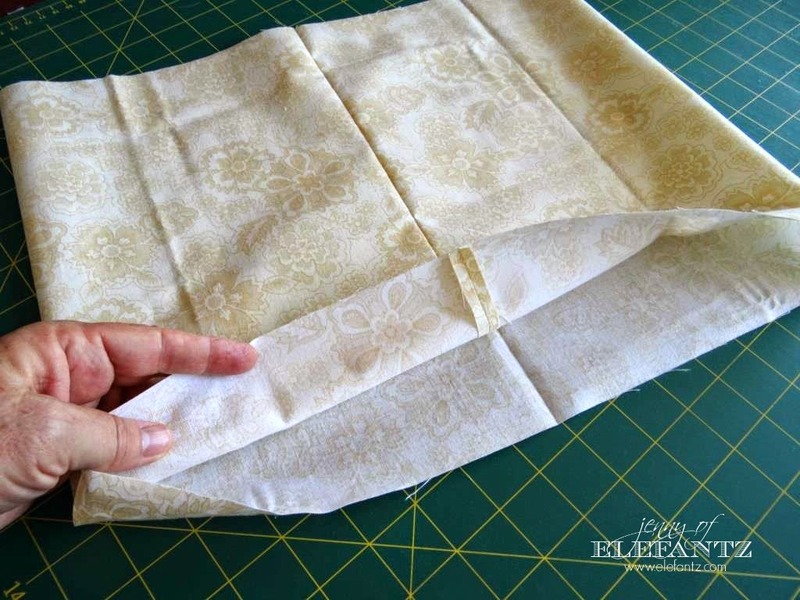 Use your iron to press the top edge flat, and to press down a 1/4" hem along the open edges. 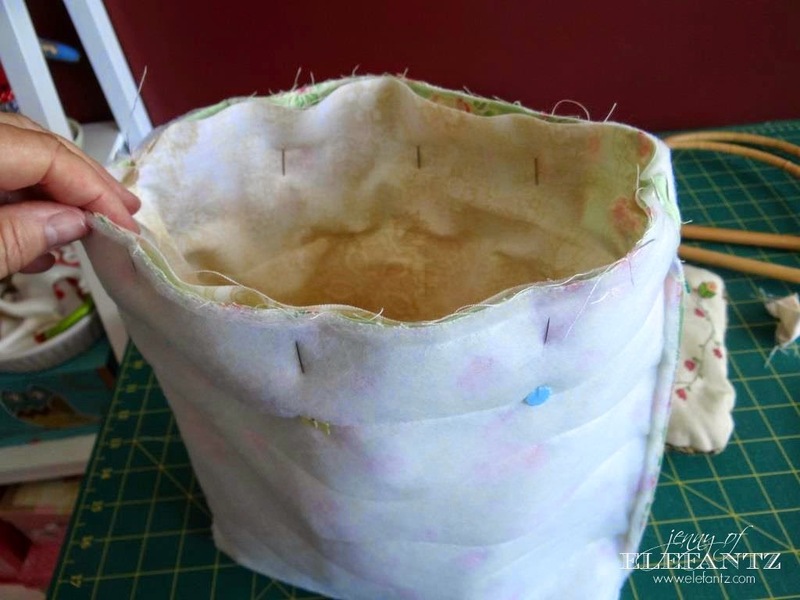 Pin the opening and ladder stitch it closed. 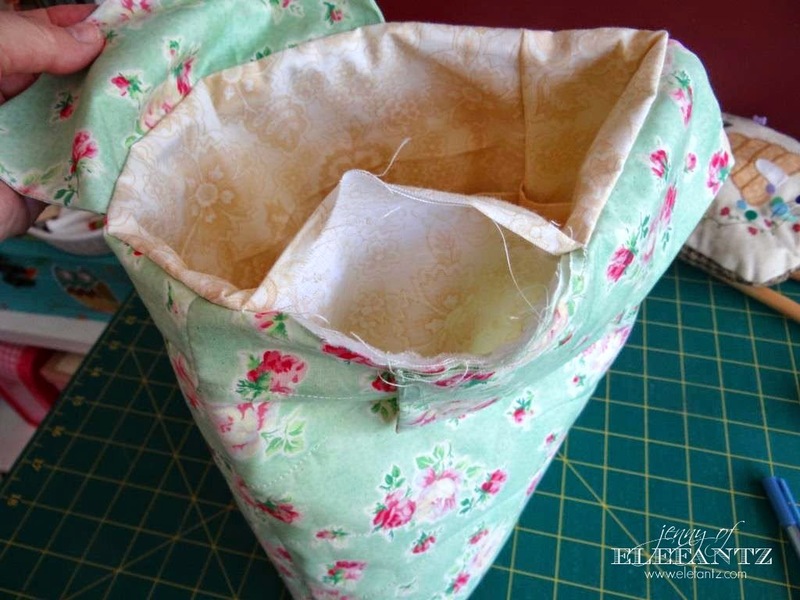 Sew the edge of the handle flaps to the inside of the bag with small slip stitches. Turn the bag right side out again, and there you have it! 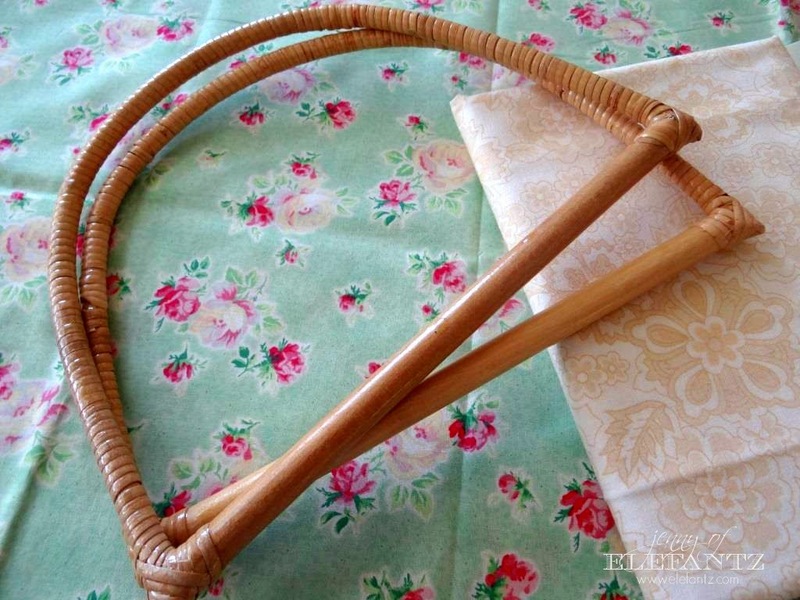 Mine is going to hold crochet, what will yours hold? 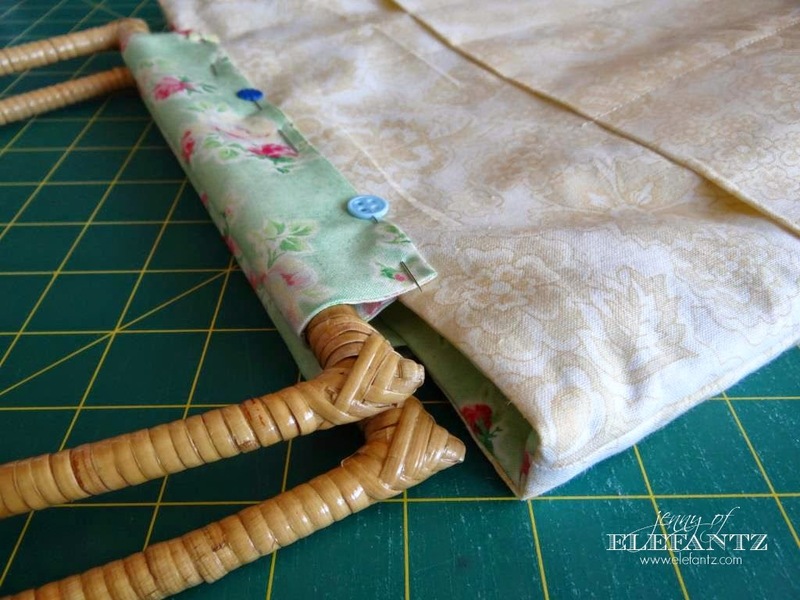 Lovely bag, Thankyou for a great tutorial. So easy to follow and so attractive. Thank you. 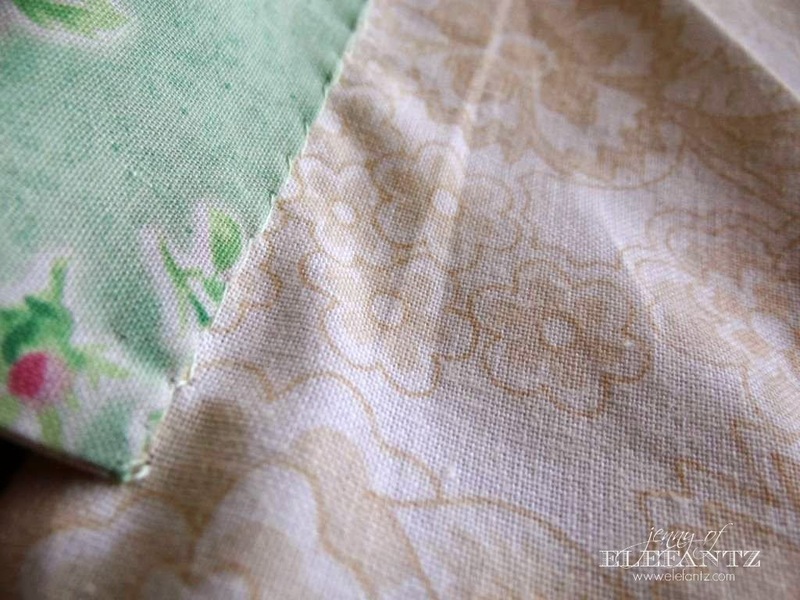 I am never drawn to those kinds of fabrics, but I always love them when you use them. Strange! 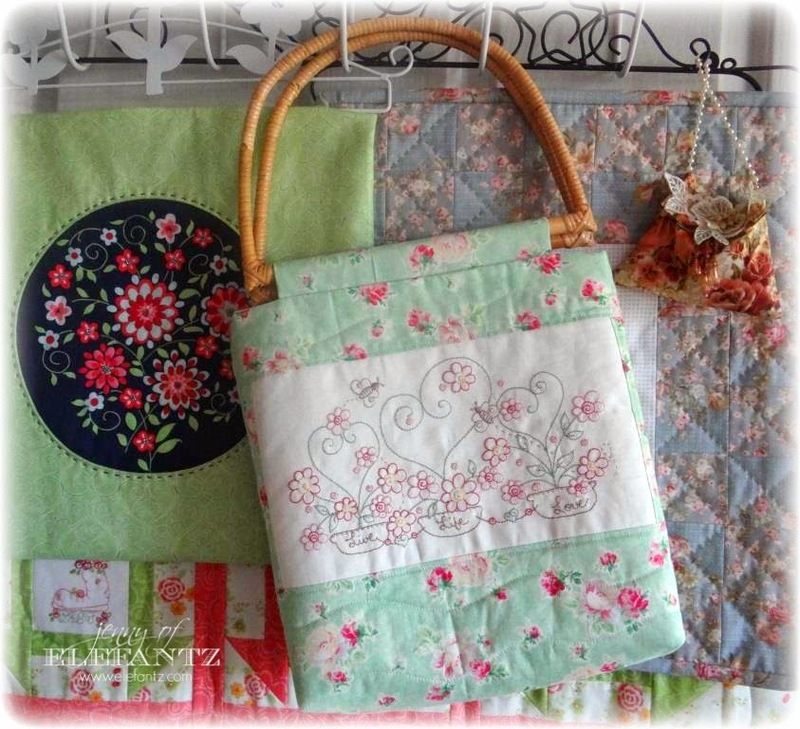 Your bag is so pretty, Jenny. Keep my eyes open for some. Love the size of them for a project bag. 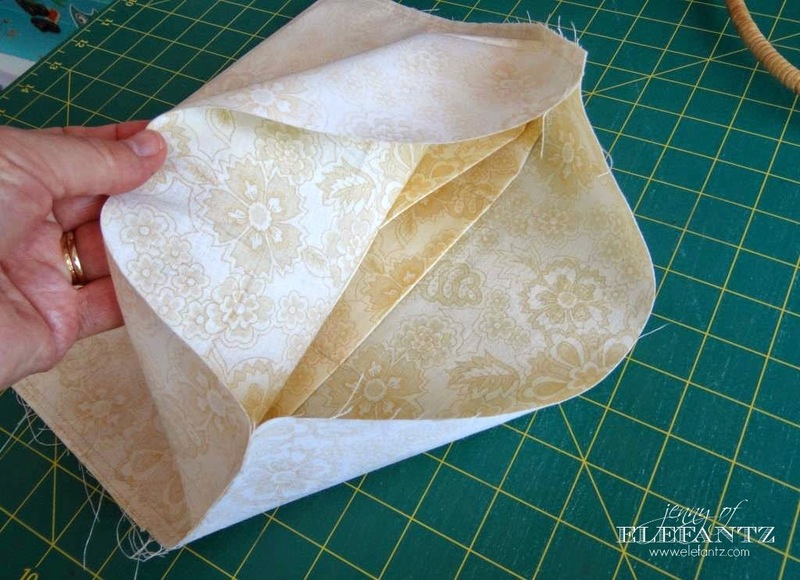 How cute is that - and a great tutorial, my dear!!!!! 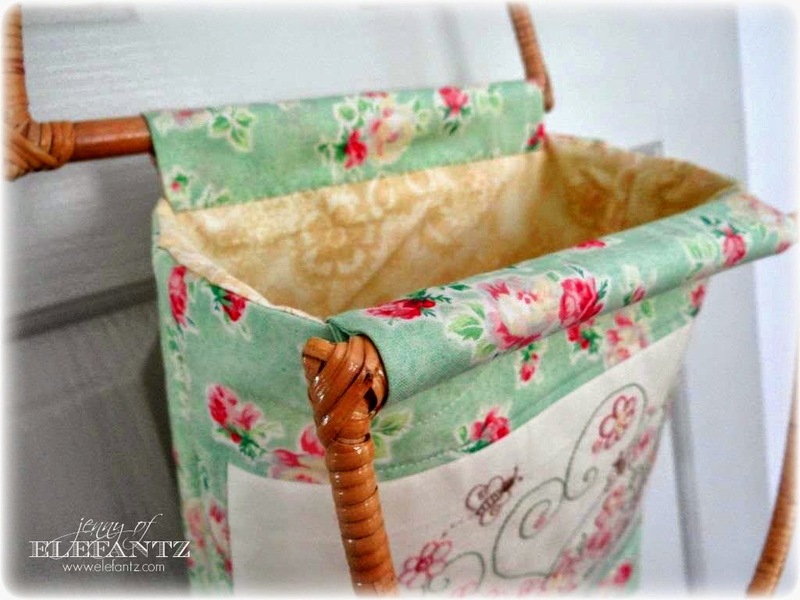 Beautiful bag - love the handles. Great tutorial!